Imagine a typical board room setting where executives are brainstorming ideas on a whiteboard, setting strategies and engaging with each other. For the boardroom, the whiteboard or screen is the heart of the room where curious people engage and take in new ideas and new skills – it’s where the magic happens. As the world’s number one monitor brand1, Dell is taking the heart of these rooms and giving them an upgrade by introducing the new Dell 75 4K Interactive Touch Monitor (C7520QT), available this Spring. With the C7520QT monitor, users will see increased engagement as it encourages real-time team collaboration for all. Meeting participants are encouraged to reach out and touch the screen. They can write or draw in real time with virtually no lag on the C7520QT monitor’s 20-point multi-touch InGlass™ screen using their fingers, palm or styluses – all at that same time. The 20-simultaneous touch capability allows multiple users to interact with the screen simultaneously, creating a truly unparalleled writing experience. When the meeting concluded, simply erase with the palm of your hand. Keep your audience captivated with brilliant visuals from start to finish thanks to the 75” screen with 4K resolution. Optimized fonts ensure visuals are sharp, and colors are vivid and consistent from virtually anywhere in the room thanks to the wide viewing angle enabled by IPS technology. Whether people are viewing the screen with morning light or with bright fluorescents, they’ll experience consistent onscreen clarity with anti-glare and anti-smudge coating, reducing distractions. The exclusive Dell Screen Drop technology features the world’s first accessibility feature2 improving reachability for users working from varying heights – ensuring collaboration is within easy reach. Buttons at the side of the panel enable users to lower the displayed image to 3 different height settings. This uniquely designed monitor is adaptable to spaces and allows for seamless integration of an optional Dell OptiPlex Micro PC into the display, resulting in an all-in-one solution. 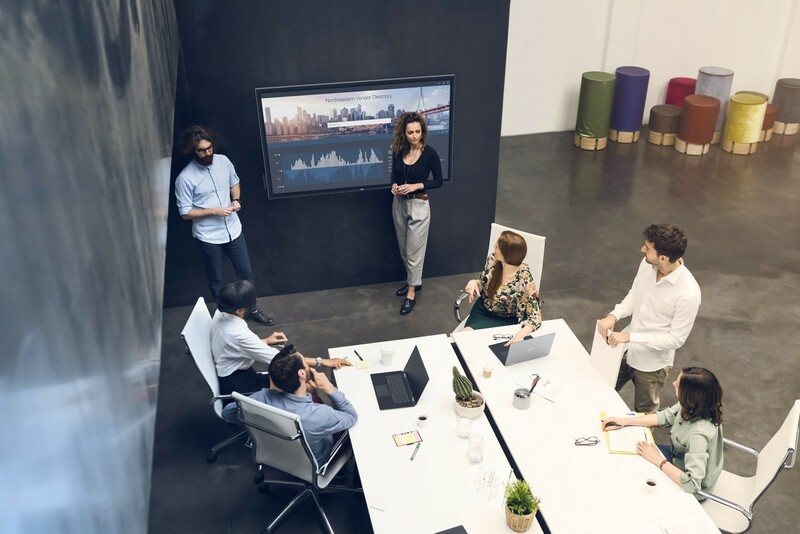 Whether the presenter is there, or anywhere else, it’s no problem – IT professionals can manage the display remotely using RS232, RJ45 and HDMI CEC connectivity. Increase productivity with real-time team collaboration and keep your audience engaged with the new Dell 75 4K Interactive Touch Monitor (C7520QT). Source: IDC Quarterly PC Monitor Tracker, Q3 2018. 2 Based on Dell internal analysis, November 2018. Available on C8618QT, C7520QT and C5518QT monitors only.